During the last week of June, several companies came to Sampsistemi HQ production plant to see the aluminum test on our multi-wire drawing machine with in line annealer. Aluminium is a good thermal and electrical conductor, which has seen it replace copper in many electrical applications. Aluminium provides a lower weight to current-carrying ratio compared to copper. Although in use for several decades in the power distribution sector (i.e. MV and LV cables, as well as OHL and OPGW), the automotive manufacturing represents the brightest growth potential for aluminium wire and cable. As automakers and suppliers continuously look for new solutions to reduce weight, aluminium is a popular candidate for applications that require high current, such as large cables under the hood. Basically in any sector where the importance of weight is crucial aluminum can play a pivotal role. There are many challenges in the wire drawing and annealing in line process of aluminum wire, however, the in house test carried out in the Sampsistemi plant has shown the success of it in term of performance and reliability. The Sampsistemi DM multiwire drawing platform is based on the splitting of gear transmission into two or more independent sections, with separate AC servomotors. This allows slip recovery between each section and at the inlet side. A 22-draft machine with three motors has a maximum slip at the wire inlet of 10-12% and reduces the slip at the separation by ca. 5%. The reduction of slipping and the improvement in the quality of gear transmission, bearings, seals, etc., have allowed a reduction in the energy consumption by up to 10-15%, consequently abating production costs. 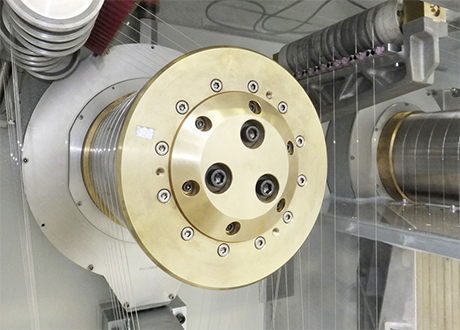 In order to manufacture the most efficient aluminum wire the annealing must satisfy several requirements, the multiwire annealer must include a number of technical features, such as protective atmosphere in the preheating path, multimotor technology, adjustable pre-heating length, a wire walker before contact rings and cleaning devices on contact rings. As per its tradition, Sampsistemi continues to pursue innovation and technology for productivity and efficiency benefits of our clients. The results of these tests met general expectations.